Last weekend I got to witness the illuminated finale of many months hard work and the atmosphere was truly celebratory and even a little festive. Saturday was a stunning day with clear skies and surprisingly warm for late November, perfect weather for the evening’s planned procession at The Willow and Wetlands Visitor Centre in Stoke St Gregory. On my arrival I must admit I was a little apprehensive parking in a field that already looked suspiciously muddy and may prove tricky to drive out of later in the dark, however the tractor parked by the gate was reassuring, these guys were prepared to tow us out if need be and after all this is Somerset, home to the best events that seem to always take place in barns and muddy fields! I was greeted in the big barn being used for rehearsals by the two crane sculptures that were made during Somerset Art Works Open Studios. The pair were busy perfecting their ‘Crane Walk’ and the logistics of rubbing beaks without colliding or completely missing one another. 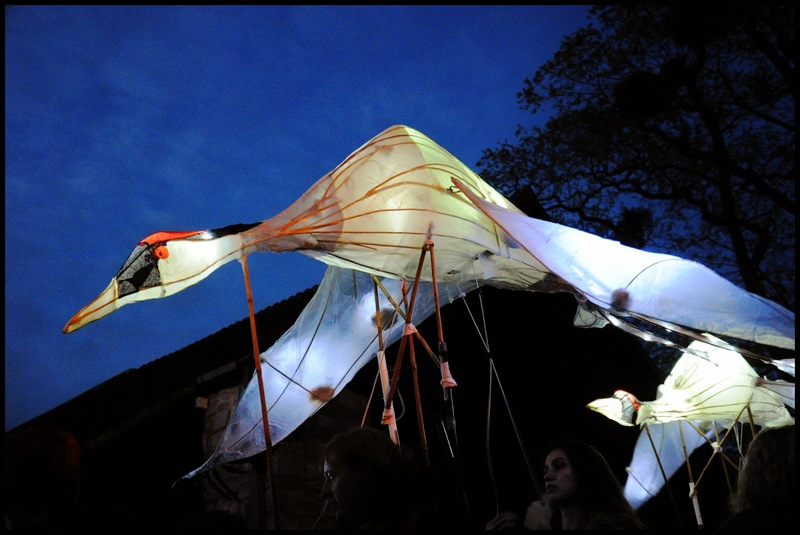 Each crane had a team of 5 people to ensure that it processed safely and elegantly; flapping it’s black feather fringed wings as it danced along. 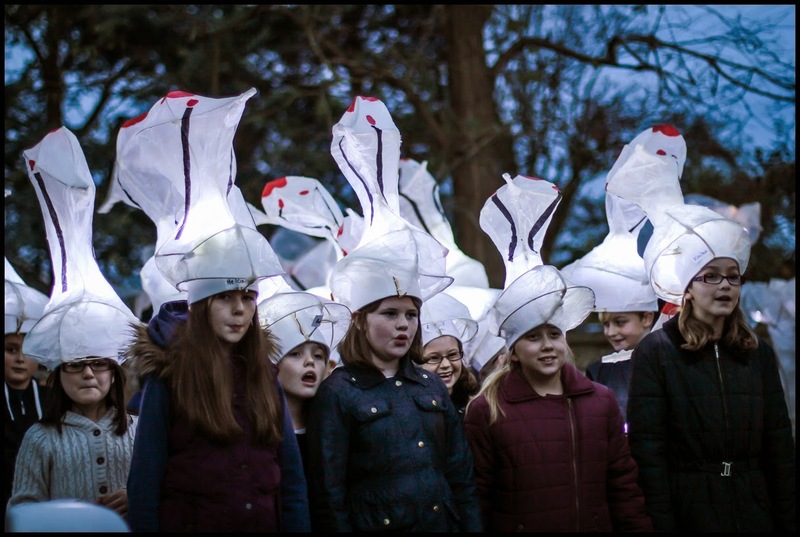 The cavernous space within the barn soon began to fill as children from North Curry, Stoke St Gregory and Heathfield schools started to arrive and claim the various lanterns, headdresses and costumes that they had made under the guidance of artist Sarah Butterworth. You can read about one of their recent workshops here. 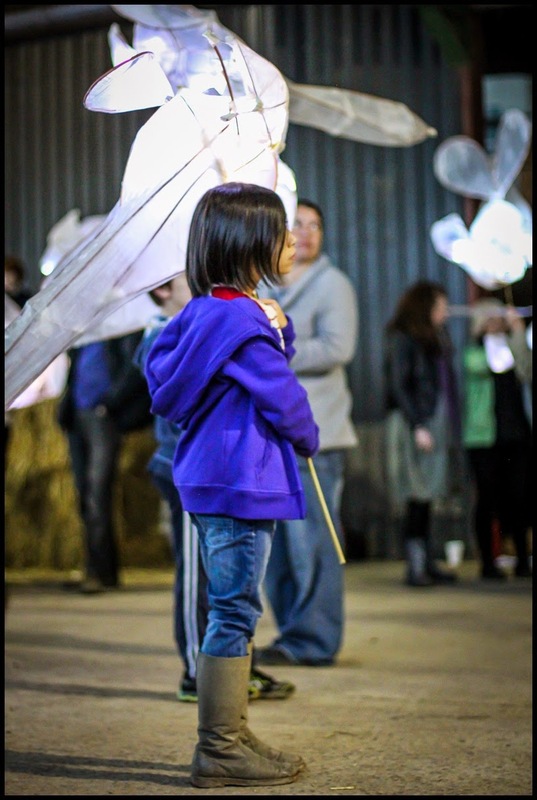 Of course children do not tend to travel unaccompanied, so relatives and friends soon found themselves also carrying a dragonfly lantern and joining the procession – my Ma being one of them, she had a fantastic time. Due to start at 4.30 it wasn’t actually that dark, Dusk was just beginning as the spectacle began and it was lovely to witness the lanterns glowing against the subtle colour change of the sky – a silhouette of a tree, heavy with mistletoe formed a serene and natural festive backdrop. In contrast the music was up beat, the children’s song they had written full of fun and the audience clapped and revelled in the spectacle celebrating all the hard work that had gone into making the costumes, headdresses, lanterns and music. At this point in the proceedings I thought that if I did get stuck in a muddy field and had to get the car towed out by a tractor it would have been worth it and would only add to the evening’s adventure! As for the cranes at the centre of all these glowing celebrations they were obviously oblivious to the dancing puppets, but I am sure if they had been close by instead of settling down somewhere safe for the night, they too would have been rubbing noses and swirling to the beat of the band. Congratulations and thanks must go to the many volunteers and school pupils who took part in the Great Crane workshops, everyone who took part in the procession, SAW’s Beccy Swain for coordinating the entire project, artist Sarah Butterworth for organising all that glue, tissue and willow, and of course our hosts for the evening, Nicola and Jonathon Coate at the Willows & Wetlands Visitor Centre, I am sure everyone went home with a smile on their face. To see our previous blog posts please Click Here.